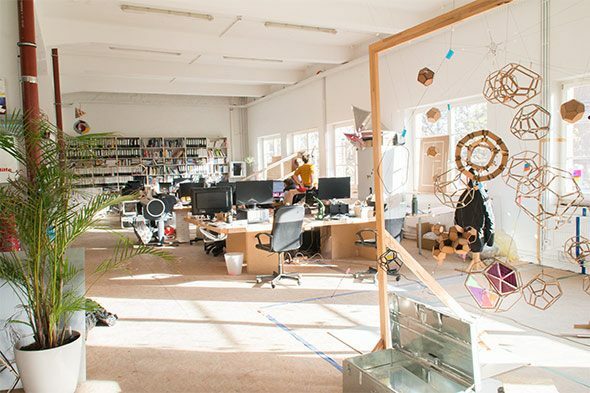 Nearing the close of our visit to Tomás Saraceno’s studio in Rummelsburg, he offered an apt metaphor that summed up the working environment of his office. 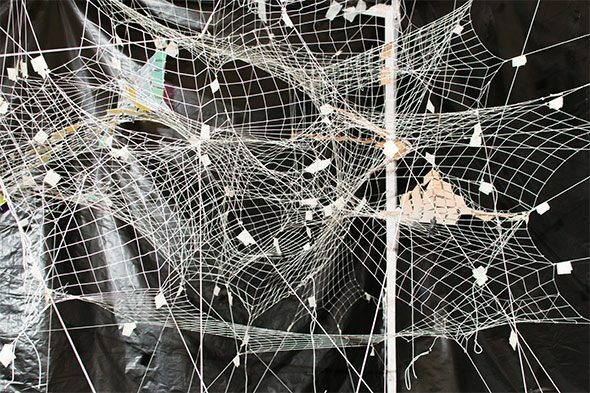 For the past couple of years, Saraceno and his team have been producing a series of spider web works, that consider the geometry and mastery of arachnid built-environments. They had allocated a special area of their studio to the spiders, who would work tirelessly to build their webs. 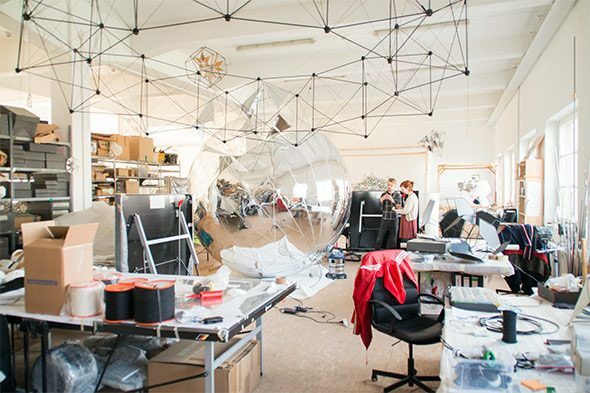 Saraceno aimed to re-create these structures, replicating nature through intricate 3D scans, and including a bio-acoustic sound element to the final installation. The spiders, Saraceno remarked, were so proficient as a team that it was difficult to tell who was organizing whom. He likened the process to the way his own studio functions: each member of the team has an indispensable job for which they are responsible, and which ensures the full-functioning of the team as a whole. In short: he doesn’t do it alone. This was apparent from our first entry into the office, which is currently under renovation on the main floor. The main office area, however, was abuzz with dozens of people working intently on their research or prototyping of tryouts, as they called their scale models. 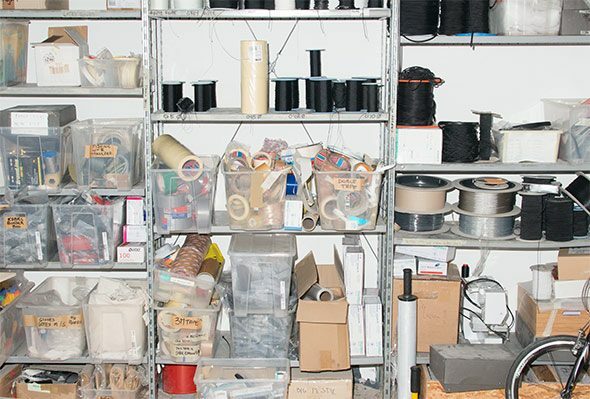 There’s a certain spatial division that prevails in the studio, where many are involved in desktop research, both into scientific phenomena and material properties. 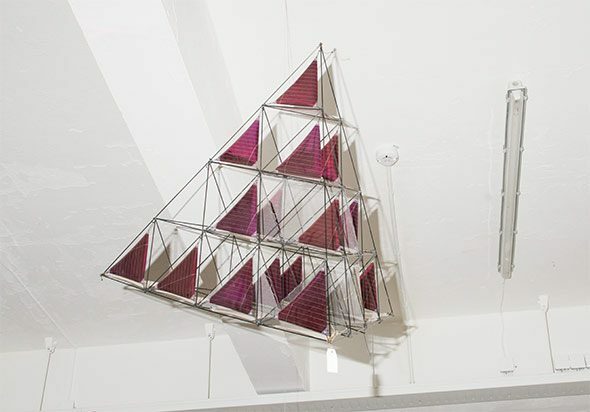 These two concerns are crucial to the final built object or installation, as Saraceno’s visions often include impressive feats of engineering and physics. We’re told that the studio space works on three-scales: small, medium and large. The medium area, where the spider web designs were in full-effect, is being renovated and much of the final, large-scale production takes place in a second building, outdoors, or on-site. 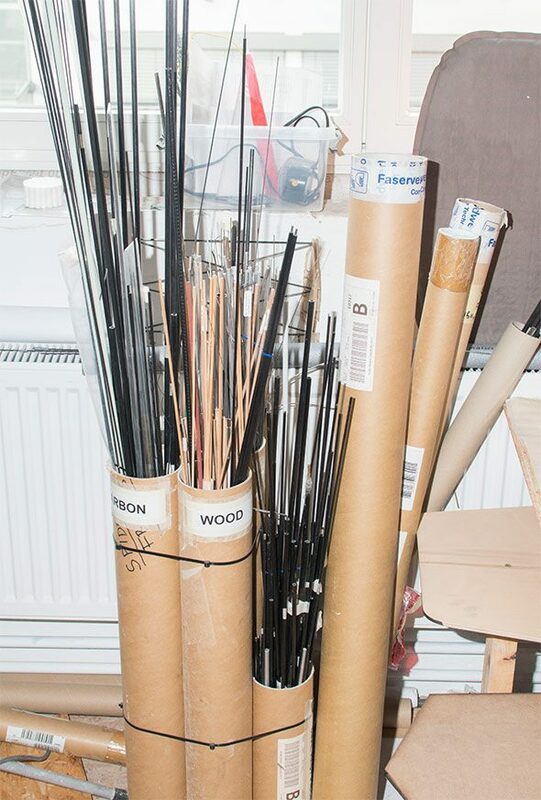 We are shown around the small scale space, where models hang from the ceiling like modernist interior design and mock-up installation areas are marked out with tape on the floor. There’s a hum from a 3D printer at the back of the brightly lit, open-concept room, as it churns out 3D models of the installation designs. 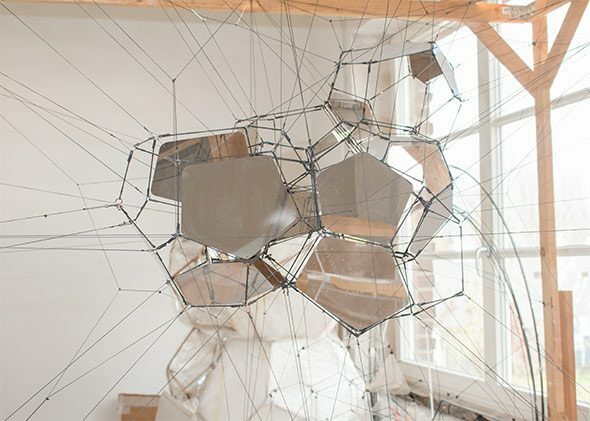 A clear disciple of American architect and systems theorist Buckminster Fuller, Saraceno often creates dome-like, floating biosphere sculptures that rely on unusual geometrical patterns. It was no wonder that he turned to natural processes like the spider’s web, reproduced in human scale. Saraceno’s work is often inspired by alternative views for accommodation and the built-environment. As a trained architect, he now works in the field of art in order to consider habitats and the cohabitation of humans and non-humans from a less rigid or formalized perspective. 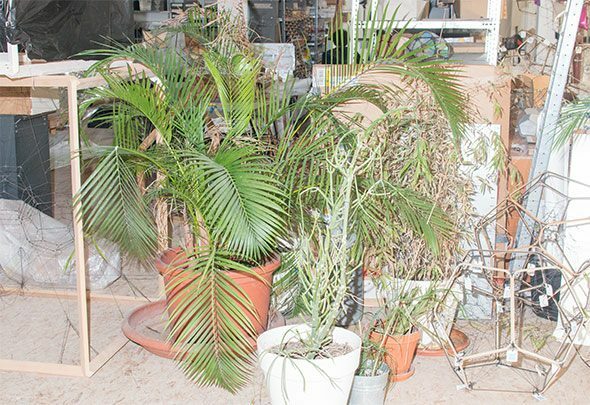 His 2011 solo-show ‘Cloud Cities’ at Hamburger Bahnhof consisted of an interactive network of cloud-like, reinforced plastic sculptures, many of which visitors could climb into and inhabit. A part of his ongoing series ‘Aerocene’ is currently being exhibited at the Grand Palais, during the ‘COP21’ UN Climate Change Conference in Paris this month. The series consists of air-fuelled sculptures, one of which – during its test flight in the White Sands – floated passengers for up to 3 hours using only solar power, making it the world’s first fully-certified solar flight. The flying sculptures are not just aesthetically captivating, but of interest to scientists as tools for imagining alternative energies. Other versions of the ‘Aerocene’ can reach heights of 40km, and can carry a small GoPro camera or other devices, making them a tool for scientific observation and exploration as well. 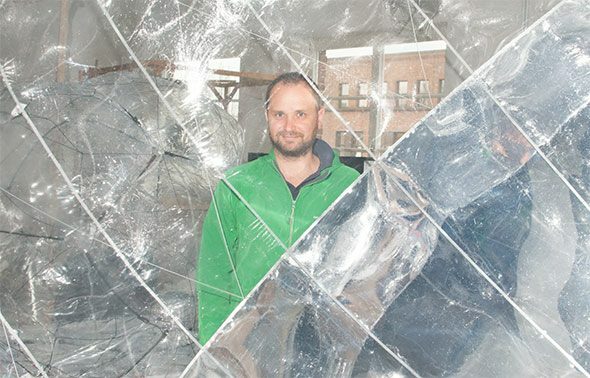 Saraceno has worked closely with scientists as an ongoing artist-in-residence at the MIT Center for Art, Science and Technology. 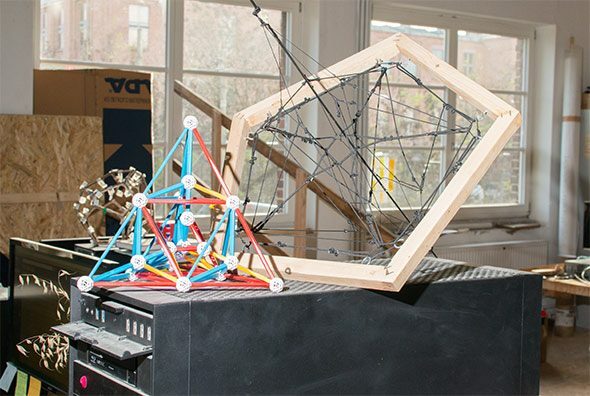 His interest in biospheres and alternative ways of living, from an architectural and artistic perspective, has made him an ideal collaborator with researchers at the institute. 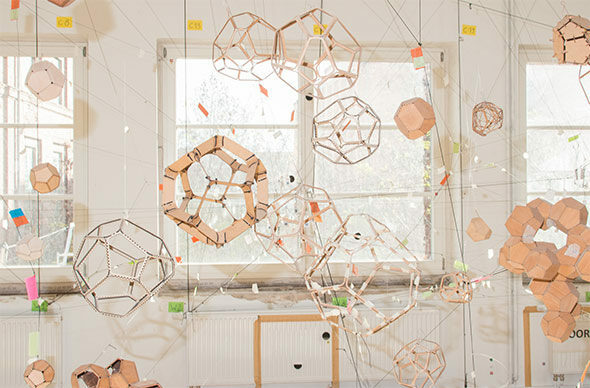 Social interaction and participation are also vital parts of Saraceno’s working process. His works do not exist within a vacuum of research and exhibition, but serve to playfully alter perceptions in major museums and art institutions. The term sculpture, often applied to his work, is a misnomer, as many of his pieces necessitate activation by the public and are not merely displayed. When asked how he is regarded within the scientific community, Saraceno remarked that, as always, these collaborations and sharing of knowledge across fields often rely on personal relations, forged by mutual interests and political outlooks. It’s clear that the studio works in a similar manner, as Saraceno seems to create a warm and friendly space for learning and testing ideas. With his current sights set on the solar balloon, Saraceno is paving the way towards new ways of envisioning aeronautics and sustainable energy resources. His inclusion in the COP21 is evidence that his projects, while also stunning in their form, are real contributors of scientific knowledge from a tangible and publicly-accessible point of view.